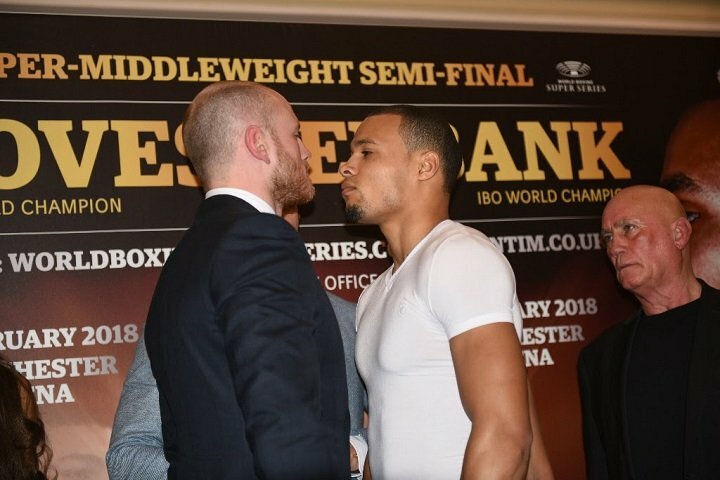 Heated words were exchanged at the kickoff press conference before the Ali Trophy semi-final bout between WBA Super World Champion George Groves (27-3, 20 KOs) and IBO-Champ Chris Eubank Jr. (26-1,20 KOs) at the Manchester Arena on February 17, 2018. “The hype behind this fight will be huge,” said Groves at Tuesday’s press conference in London. “I hope the fight justifies it. On paper this is billed as a 50-50 fight with Eubank Jr. maybe even being made the favourite. But I don’t really understand that. “George seems to be hung up on what I’ll do. He needs to worry about himself. Thinking about me isn’t going to get him anywhere. I’m a man of my word and George, you will not see the end of the twelfth round. “This is a special fight,” said Kalle Sauerland, Comosa’s Chief Boxing Officer. “When we saw the original eight fighters in the line up it was a dream in the distance. But on February 17 in Manchester the battle of Britain will commence. Groves vs Eubank Jr is a super-fight that surpasses the normal standard of boxing’s big fights. It really is a mega fight. It’ll be an enthralling build up between two unbelievable athletes, two unbelievable characters who are both great for the sport. The storyline was written by the tournament. It came alive in the hot atmosphere of Stuttgart where we saw a sublime performance by Chris Eubank Jr. and a week later George Groves took care of a very talented challenger in Jamie Cox. Manchester Arena, Europe’s largest purpose-built indoor arena will be at capacity to witness what promises to be the biggest Super Middleweight night in years. “We will work hard over the coming weeks to release extra tickets to meet the huge demand of this fight,” said Sauerland.